As I type this on Sunday evening the advance guard of ex-hurricane Katia is rattling our doors and spattering our windows with raindrops hard as machine-gun bullets. And this is especially bad news because tomorrow we’re travelling up to Wick on the far northeastern tip of Scotland for a few days (think John o’Groats, then turn right, stopping before you hit the ocean and then down a bit) – just when the main force of dear old Katia is supposed to arrive like a Biblical plague (frogs for preference). The forecasters are talking about 70+ mph winds and the possibility of flooding, though to be fair they do rather tend to take a pessimistic view. (“It’s going to be a hurricane, well, more of a tropical storm, but anyway, definitely a flood – did I say a flood? I meant heavy rain; either way, there could be puddles, some of them quite deep – though not so much rain now I come to think of it, more a sort of drizzle, definitely a mist. Look, be on the safe side, take some sunblock just in case.”) Actually, the worst of it’s supposed to hit the central belt and the west, so as we’re going north and east we should be OK. I paid yet another visit to my favourite hospital last week to see a consultant about my tinnitus and a blocked sensation I get sometimes in my ear, as when I used to play rugby and someone’s knee would collide with the side of my head – which was rather a feature of my rugby-playing days, alas. First they made me take a hearing test, which involved putting on a set of headphones and pressing a button when I heard each of a series of bleeps and boops – not unlike listening to King Crimson LPs in my youth – and I was delighted to be told that there’s nothing wrong with my hearing (except the constant noise like a dentist’s drill buzzing away). Ah, well. 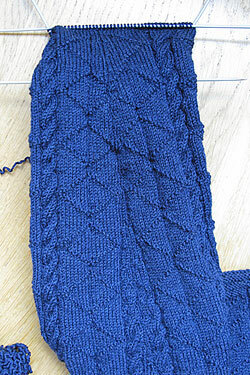 As you will see from the pictures, the gansey is almost completed – just the 6 inches of ribbing on the cuff to go. 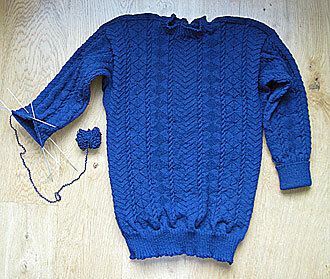 Should be done this week, wind and weather permitting, after which it just has to be washed and blocked. I’m already thinking about my next project – I had planned to knit a gansey for a friend of mine from Musselburgh, but he still hasn’t given me his measurements, the swine. I may have to use underhand, devious, low tactics and ask his wife. This week’s bread is Dan Leader’s “quintessential French sourdough”. It’s made with white flour mixed with some wholemeal and rye, to which I added some honey to un-sour it a little. The rye flour changes the consistency, so that it’s a bit like kneading a cement made from the ash you find left in your grate after a fire. Still, it gives a nice crackling crust and a chewy crumb with lots of holes – what more can you ask for? Have fun in Wick and wave at the North Sea for me. The gansey is, as expected, stunning. No worries about Katia–you have ganseys to protect you from the wind and rain! The gansey look wonderful, the colour is so nice, your uncle will ware him day and night!!! Why right by Wick and not left? The way from Wick to Durness is so beautiful!! I loved the Scottish weather report… I visited Scotland on a tour back in the spring of 2001, and the guide kept saying “You’re not getting the true flavor, it’s supposed to be raining…” – it was sunny the entire time. I like blue skies, and the blue of your almost-completed gansey. Well, we’re back from Wick now, and yes, it rained every day. (I made an important discovery while walking over the saturated, boggy fields – viz., that I don’t own a pair of trainers that don’t leak.) Will post a full report tomorrow, together with news of an Important Development, more important even than my revelation about my trainers. Thanks for the positive comments and support, as ever.